Title: Shall We Be More Tender With Our Dollars Than With The Lives Of Our Sons? Comments: In this great poster we have a lot going on. It leads with Secretary of Treasury William G. McAdoo's quote (McAdoo married President Wilson's daughter and was later a United States Senator). 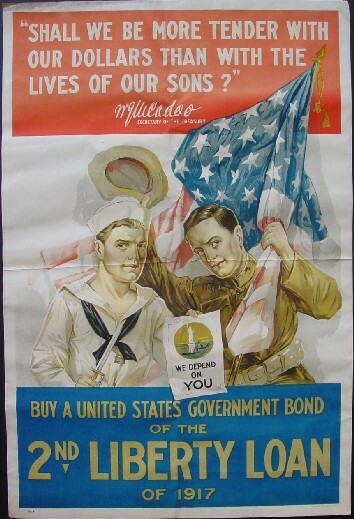 The main picture is a soldier holding a flag and his hat and a sailor holding a knife and a poster picturing the Statute of Liberty with the slogan "We Depend on You." All this in an effort in 1917 to get citizens to buy more government bonds as a part of the Second Liberty Loan campaign. Condition: Very good with usual folds and small repaired tears on the upper left margin.